Confucius was a Chinese magistrate in 500 B. C. He lost the favor of the Emperor and wandered from city to city, teaching and giving counsel. After his death, Emperor and people alike bowed before his shrine. Meng Yi asked the duty of a son. “What did ye mean?” said Fan Ch´ih. Meng Wu asked the duty of a son. Tzu-yu 3 asked the duty of a son. Tzu-hsia asked the duty of a son. Tzu-kung asked, What is a gentleman? Tzu-chang 6 studied with an eye to pay. Chi K´ang 8 asked how to make the people lowly, faithful, and willing. Tzu-chang asked whether we can know what is to be ten generations hence. Note 4. The Master’s favourite disciple, Yen Yüan. Note 5. The disciple, Tzu-lu. Note 7. 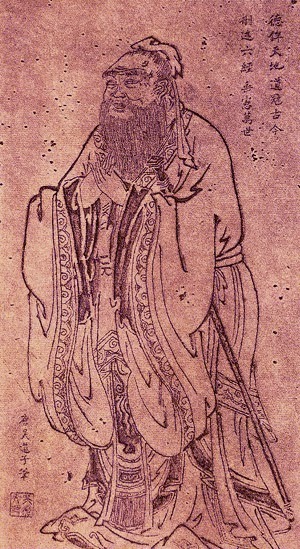 Duke of Lu, during Confucius’ closing years. Note 8. Head of the Chi clan during Confucius’ closing years. Note 9. The three dynasties that had ruled China up till the time of Confucius. Note 10. The three dynasties that had ruled China up till the time of Confucius. Note 11. The three dynasties that had ruled China up till the time of Confucius. Lin Fang asked, What is the life of ceremony? The Chi worshipped on Mount T´ai. 4. “Then does courtesy follow after?” said Tzu-hsia. One asked about the words of the Great Sacrifice. The Master said: “I do not understand them. Could one understand them, he would overlook the world as I this”—and he pointed to his palm. Worship as though those ye worship stood before you; worship the spirits, as though they stood before you. On entering the Great Temple, the Master asked how each thing was done. On hearing this, the Master said: “Such is the ceremony. Duke Ting asked how a king should behave to his ministers; how ministers should serve their king? Note 1. An imperial prerogative. Note 2. An imperial prerogative. Note 4. A prerogative of the Duke of Lu. Note 5. A disciple, in the service of the Chi. Note 7. Wang-sun Chia was minister of Wei, and more influential than his master. Kitchen God is less honourable than the God of the Home (the Roman lares), but since he sees all that goes on in the house, and ascends to Heaven at the end of the year to report what has happened, it is well to be on good terms with him. Note 8. A disciple of Confucius. Note 9. Literally “to cause the people to be in awe.” The commentators are more than usually learned over the Master’s anger. I attribute it to the foolishness of the pun, and translate accordingly. Note 10. Kung Chung (+B.C. 645), a famous man in his day, was chief minister to the Duke of Ch´i, whom he raised to such wealth and power, that he became the leading prince of the empire. His chief merit lay in crushing the barbarous frontier tribes. The rest of his work, being in the sand, died with him. The Master said: “Wealth and honours are what men desire; but abide not in them by help of wrong. Lowliness and want are hated of men; but forsake them not by help of wrong. After the Master had left, the disciples asked what was meant. Note 1. The disciple Tseng-tzu.